XtreemOS is a Linux-based operating systems that includes Grid functionalities. It is characterised by properties such as transparency, hiding the complexity in the underlying distributed infrastructure; scalability, supporting hundreds of thousands of nodes and millions of users; and dependability, providing reliability, highly availability and security. The school is open to postgraduate level students (MSc, PhD) and young researchers (from technical industries, research laboratories, and academic environments) who have recently started (or are about to start) working on grid research projects. Prospective students from computer science, computational science and application backgrounds will be encouraged to apply; Basic knowledge in distributed systems is the only prerequisite. Grid newcomers and beginners are welcome, but people already involved in grid projects should also benefit from this school. The welcome reception will be combined with a poster session of research work of the school participants. If you plan to present a poster, please check on the registration fax. There will be specific time slots dedicated to discuss research topics with the school participants. PhD and MSc students are encouraged to submission short presentations about their work. A shortlist of presentations will be selected by a committee comprising of XtreemOS members. There will be an award to the best presentation! The XtreemOS Summer School will take place at Science Center Reisensburg Castle of Ulm University near the town of Günzburg, which is located about 40 km east of Ulm. 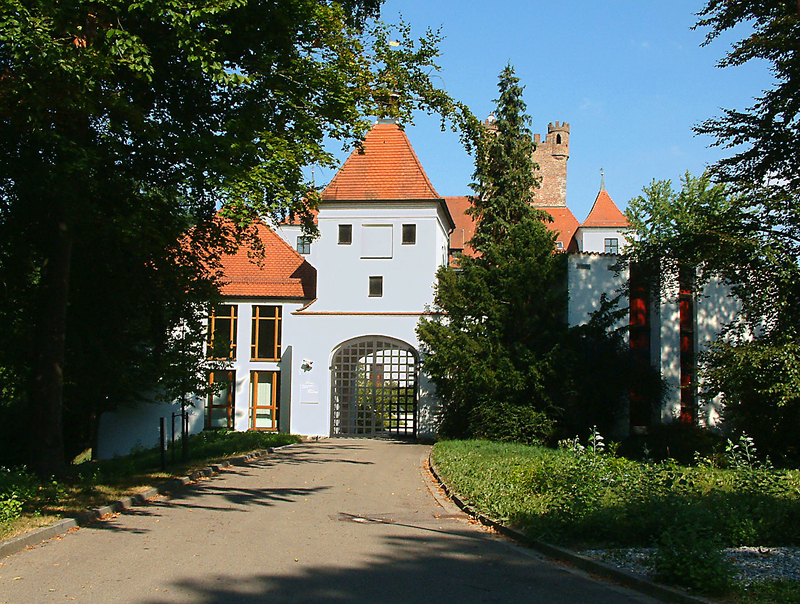 The picturesque castle „Schloss Reisensburg“, dating back to the 14th Century and now owned by Ulm University, is situated on a hill close to the Danube River providing high-quality accommodation and conference facilities for seminar guests of Ulm University. Find Reisensburg Castle on Google Maps. Students and post-docs, as well as scientists, interested to attend the XtreemOS Summer School 2010 are kindly invited to fill out the offline registration form: here. This offline registration form (interactive PDF) must be completed, then faxed or emailed to the school organisation (contact details on the form). Nota Bene: Online registration is not provided. The deadline for registration is June 28, 2010 and the early registration fee is available till May 31, 2010. Optional: guided tour in Ulm on Friday 9th afternoon. The rooms have their own bathroom with shower. There is free Internet via WLAN within the castle and in the rooms. A social programme will support the curriculum so as to help students to form lasting friendships and enhance collaborative research. The participants are expected to plan their arrival on the Monday morning, July 5th, 2010, and their departure on Friday afternoon, July 9th, 2010. Lunch on Monday will be provided at 12:30 GMT. If you wish to arrive on Sunday, July 4th, or leave on Saturday, July 10th, you can do so by paying an extra fee for accommodation on those days (see registration form). The nearest international airports are located in Stuttgart, Munich and Frankfurt. Frankfurt has the best connectivity, but is the farthest. At Frankfurt airport there is a train station located directly within the terminal from which one can take a direct train to Ulm. Arriving in Ulm it is necessary to change into a train to Günzburg (total time from station to station from 2:40h to 3:20h). At Stuttgart and Munich airport, a local train (S-Bahn) brings you to the Stuttgart/Munich main station, from which you can catch a train to Günzburg. From Stuttgart airport the total time from station to station is from 1:50h to 2:20h. From Munich airport travel time is very variable between 2:00h to almost 3:00h. For timetables please see the next section. As "from" you can provide any station within Europe. Use "Frankfurt(M)Flughafen" for Frankfurt airport, "Stuttgart Flughafen" for Stuttgart airport, and "Munich Airport" for Munich airport. As "to" please type "Günzburg", or "Guenzburg" if you do not have umlauts handy. On Monday morning we will set up a bus shuttle service from Günzburg station to the castle. Otherwise we recommend a cab which is available in front of the train station. Your destination "Schloss Reisensburg" is only 2 to 3 km from the station. If there is no taxi at the station, please dial +49.8221.1414 or +49.8221.1515 for local taxi companies. Leave Autobahn A8/E52 (coming from either Stuttgart or Munich) at exit "Günzburg" (Number 67) and follow the signs to "Günzburg". Stay on this road for about 3.3 km. At the junction "Günzburg Nord/Bahnhof" turn to the left. After about 200m turn to the left again. After about 50m turn again to the left into "Reisensburger-Straße", signposted "Reisensburg". This road leads you into the urban district of Reisensburg. When the road ends in a final junction (after about 1.2km), turn to the left and follow the road straight ahead and up the hill. On the top you will find a free parking lot in front of the main gate of Reisensburg Castle. The XtreemOS Summer School is an official activity of the EU XtreemOS Project.